Kagame: “Our Guy” or His Own Man? Who is rethinking African development? As the 2nd Annual Kilombo Conference starts this Friday 27th September 2013 in Peki Ghana, it is critical for the African Diaspora and Africans all over the continent to be with our brothers and sisters discussing the right way forward for our motherland. In February 2013 while researching about the history of Pan Africanism I found out that from the initial Pan-African Conference held in Manchester in 1945 at which Nkwame Nkrumah took part, 12 years passed before Ghana became independent in 1957. 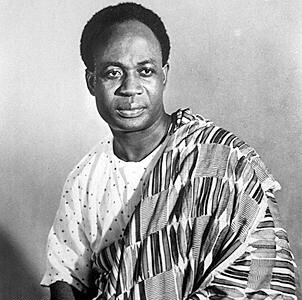 In 1958 at the first All African People’s Conference which invited leaders of already independent African states and those of African movements of liberation from across the continent, participants learnt from Nkrumah a big deal in freeing the continent and efforts of uniting it against the then colonialist powers and future neo-colonialist forces. 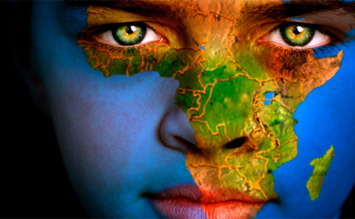 It is more than a half century since those years of the continent’s political independence and early organizing for African unity, but the context seems not to have changed drastically. Our countries are still seen from outside through the loops of the heart of darkness of Joseph Conrad. Only actors and strategies of exploitation of the continent from that past appear today different, but the fundamentals remain the same as those of back then. The spirit of our forefathers lives on in some of us. We are today seeking solutions to the real problems of poverty and freedom of Africans at the grass root level in rural and cities. Kilombo Centre is one of such examples. 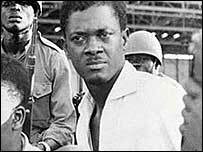 Patrice Lumumba. He was among the participants of the All African Peoples’ Conference held in Accra in 1958 and organised by Nkwame Nkrumah. Though some of us are far from the continent physically, we are totally with you in spirit. Please consider this as a testimony of our total support and commitment to what Kilombo is doing to improve Africans’ lives radically, no matter how long it will take and all the sacrifices to be endured to get there. From a national strategic perspective, the Presidential Advisory Council [PAC] structure in itself and initial conception would be a significant means for the development of Rwanda. Unfortunately, since its launch in 2007, what it has achieved is primarily to reinforce apartheid types of policies which exclude the majority of Rwandans, prioritizing a separate development benefiting a tiny minority consisting mainly of Tutsi elites while the rest of the Hutu population is in the process dispossessed of the little assets it had, its children are excluded from education, is unemployed, and health is only available to the wealthy. Another important aspect of the PAC structure and its neo-liberal tendency – apparently linked to its selective particular foreign membership – is that it has become an instrument for the Rwandan president in gaining support for his regional or national misdeeds, either for his interference in Congo to plunder mineral resources or his crackdown on political dissidence and stifling democracy. As of 2009 the list of PAC members was as follows. Obviously many names do not appear anymore in the present membership or new others do for different particular reasons. Others have changed positions or allegeances. Kaia Miller – founder of Aslan Global, Inc.
Joe Ritchie – Rwanda’s Honorary Consul in Chicago, founder Fox River Financial Resources, Inc and CEO of Rwanda Developement Board. Pastor Rick Warren – Religious leader, founder Saddleback Church, and PEACE Plan. Prof. Michael Porter is also a member of PAC though he did not attend the launch. Michael Fairbank, Chairman Emeritus and founder of The OTF Group, a software and strategy consulting firm based in USA.